UNROASTED coffee beans have it in them to protect crops, found a team of Brazilian scientists. 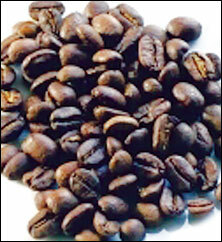 Legumin, a compound found in coffee seeds, represents 45 per cent of its total protein content. It protects the plant from pests. Paulo Mazzafera from the University of Campinas in Brazil and his team used the protein from two species—Coffea arabica and C racemosa— against cowpea weevil larvae. When the weevil larvae fed on the coffee plant’s seeds, these proteins bound to their chitin— a complex carbohydrate that composes the cell wall of the larval gut. This impeded further growth. Experi - ments showed tiny amounts of the proteins could kill up to 50 per cent of the insects. Weight of the surviving larvae lowered significantly. “Scientists can insert such genes into important food crops such as wheat and maize so that the crops can produce their own insecticides,” said Mazzafera. The proteins appear harmless to people and can cheaply be produced in large quantities via microbial cultures. Dawn Luthe, professor of plant stress biology at Penn State University in USA, said if a combination containing a plant protein and a common insecticide is used, it may be more lethal to crop pests than either used alone. “It will take longer for the insects to develop resistance to two modes of attack,” he added. The Journal of Agricultural and Food Chemistry reported the study on May 26.